Are you in need of health insurance but still want to work from home? 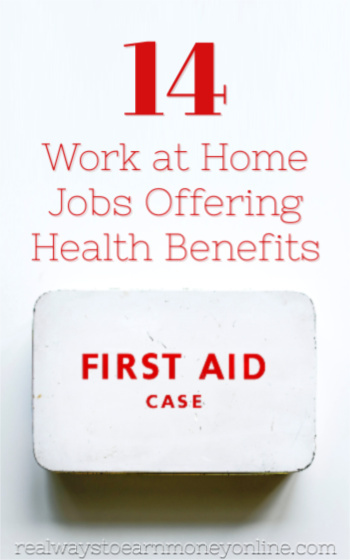 Are you finding that most work-at-home jobs do not offer health insurance? Are you always on the lookout for a better policy to replace your current one? If so, you'll be happy to know this article shares and explores 14 companies that will hire you not only to work from home, but that also provide you with a few well-deserved benefits, including health insurance! Why Don't Most Work-at-Home Companies Provide Health Insurance? If you are used to having health insurance or had it when you worked outside the home, you may wonder why most work-at-home companies just do not offer health benefits. There are several reasons for this. Traditionally in the late 1990's, work-at-home companies only hired workers to work as independent contractors, which means they were NOT employees and did not qualify for benefits of any kind—especially health insurance. Other work-at-home companies were only set up to offer freelance, contract or seasonal work. However, now with more and more companies offering work-at-home positions, workers from the “old traditional workforce” naturally want health insurance. How Do Most Home-Based Workers Find Health Insurance? In the past two decades, most of those who worked at home “freelancing” depended on a spouse or partner (with traditional employment) to carry them on a health care policy. Freelancers could also join The Freelancer's Union to gain not only health insurance, but also life insurance and retirement plans. Obama Care was also another option offered to the uninsured during the Obama Presidency (2008 to 2016). Then there were retirees, who worked at home, that could also depend on an insurance policy as part of their retirement package, or if they were 65 or older they would have Medicare with the option of adding a Medicare supplement. Anyone over 50 also could join the AARP and take advantage of their insurance policies, too. The National Bankruptcy Forum states that medical debt is the number 1 reason most Americans will file Chapter 7 bankruptcy. With a statistic like this, it makes sense why workers want and need health insurance. Which Work-at-Home Companies Currently Offer Health Insurance? AAA – Also known as the American Auto Association, this call center hires workers to work at home and not only offers them medical insurance, but also travel and hotel discounts, retirement, and paid time off. Alorica – Read Alorica Review – Formerly known as West or West At Home, this call center started out only hiring independent contractors then switched everyone from independent contractor to employee with benefits. Pay is between minimum wage to $10 an hour with the option to purchase health and dental insurance from a third party carrier after 30 days. American Express – Read American Express Review – This remote call center offers medical, dental, vision, and retirement packages. American Express also offers a full 40-hour schedule with 24/7 scheduling with most employees starting between $13 to $20 an hour with top earners making up to $28 an hour with the performance bonuses and incentives. Asurion – Read Asurion Review – This remote call center offers medical, dental and vision insurance, 401k plan, life insurance, and employee assistance plans. Employees start at around $11 an hour. Capital One – Read Capital One Review – Employees working in Capital One's remote call centers receive generous incentive and performance bonuses with most jobs starting around $13 an hour. In addition to receiving health insurance benefits, Capital One employees are also offered 401k match available from the first day with the rest of the benefits following at the 6-month mark. Vision and dental coverages may also be added. Carlson Wagonlit Travel – Read Carlson Wagonlit Travel Review – These remote travel agents receive life, accident, disability insurance, emergency travel assistance, health, medical and dental coverage, maternity and parental leave, access to health and wellness clinics and webinars, and a retirement plan. Century Link – This customer service based phone job starts at $11 or $12 an hour, but has several benefits including include medical insurance, dental insurance, vision plan, health and wellness programs which can include such things as gym membership or fitness equipment. There is also paid time off, holidays, 401k plan, life insurance, and short and long term disability. Concentrix – Read Concentrix Review – This call center offers customer service and sales jobs as an international staffing company, which supports the industries such as automotive, banking, consumer electronics, e-Commerce, government, healthcare, insurance, technology, media, travel, and transportation. Both part-time and full-time work-at-home agents are offered paid holidays, a pension plan, paid training, and monthly incentives. You must be full-time to be offered health insurance. Enterprise – Read Enterprise Review – These remote call center employees make $12 an hour and their benefits include insurance (health, dental, life), disability, retirement, time off (paid and unpaid), and discounts on their services. Sitel – Read Sitel Review – These remote call center agents handle anything from billing questions to troubleshooting technical issues. Sitel hires in most US States. Benefits are offered to full-time employees after 90 days. These include medical and dental insurance, vacation and holiday pay, employee discounts, and a 401k match. Support.com – Read Support.com Review – These customer service agents earn between $10 to $18 an hour. Benefits for US employees include things such as full health care coverage, life insurance, paid holidays, and vacation days. Sykes – Read Sykes Review – This company was once called Alpine Access. This work-at-home call center starts employees at $9 an hour and offers a 401k retirement package after one year of employment as well as medical, dental, and vision insurance after 30 days. U-Haul – Read U-Haul Review – These call center employees are hired both seasonal and full-time. Some positions are seasonal and do not include benefits. Permanent call center employees can earn between $14 to $15 an hour with limited-care medical, dental coverage, travel insurance 401k, stock options, and employee discounts. World Travel Holdings – Read World Travel Holdings Review – These travel agents receive a large array of benefits which include health and dental insurance, 401k, employee referral programs, vacation and sick days, and disability insurance. Employees receive discounts on trips as well. It appears that health insurance is one of those benefits that are offered based on your hours, state, and also your time with the company. Work-at-home companies that do hire employees verses independent contractors are offering some of the top insurance carriers such as Anthem, Century, Cigna, and United Healthcare as their insurance carriers. So, with the whole concept of work at home growing, there is no reason not to have the insurance you need. Just sign up with one of the companies listed above or any other company that hires remote employees and offers health insurance. If you happen to know of any other work at home companies that offer health insurance, please feel free to share that information in the comments below!